Four relievers, Aaron Judge and Didi Gregorius bailed out the Yankees. On a Tuesday night in the South Bronx, 161st Street rocked New York City. That crowd, as exuberant as it was, rode on every single pitch during the Yankees’ wild-card game tilt with the Minnesota Twins. Luis Severino hurled a 100-mph fastball down the middle for strike one. That was the postseason’s first pitch, and the 23-year-old’s best. All before the Yankees picked up their bats, their ace gave up two home runs and three earned runs and exited with the shortest postseason stint (1/3 inning) by a starter who wasn’t injured since 2000. The Yankees threw their way out of a three-run deficit using four relievers. That’s it. Just four arms punched out 13 batters over the course of 8 2/3 innings, stopping the Twins from scoring more than one run on five hits. That’s 26 powerful outs after the Yankees’ worst nightmare of an opening. With a combination of Chad Green, David Robertson, Tommy Kahnle and Aroldis Chapman, the Yankees bullpenned their way to the ALDS on an 8-4 win over the Twins. 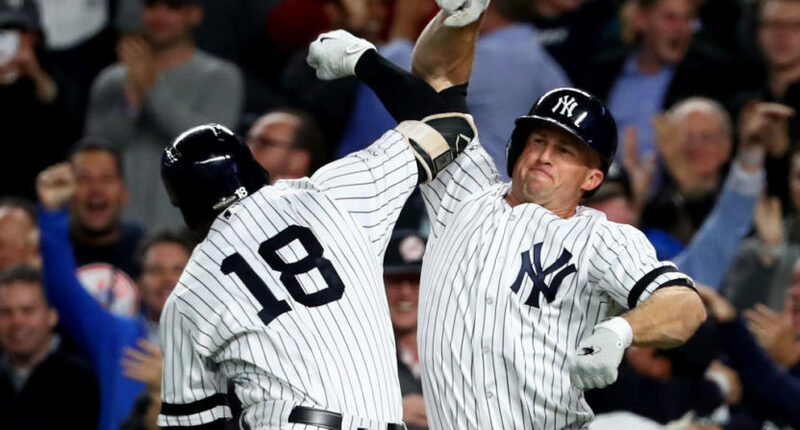 At the heart of that magic stood Robertson, providing a sense of deja vu for Yankees fans as he mowed through the Minnesota lineup. Robertson came on with the bases loaded in the 3rd, and Girardi pushed him to the longest outing of his career (3 1/3 innings). He struck out five batters and worked through outs by mixing command with control, returning structure to the back-and-forth tilt. “[Robertson] definitely did what he was doing all season. And it wasn’t just him,” Gary Sanchez said, via YES Network, through a translator. Who else did what we’ve seen him do all season? Aaron Judge cranked the first postseason home run of his career, a two-run shot to left, to put the Yankees up 7-4 in the 3rd inning. But he also did something we’ve never seen him do before. Judge dropped his bat, rounded first base and smiled. That emotion coming from a humble giant who finds it hard to praise his own record-breaking talent helped drive the Bronx Bombers to their first postseason win. Brian Dozier and Eddie Rosario each mashed homers off Severino, ending their seasons on 35 and 28 jacks, respectively. Though the Twins’ offense followed through on its plan of attacking early, one clutch swing from Didi Gregarious in the bottom half of the first put the Yankees ahead 4-3. The trickiness of the all-or-nothing Wild Card format bested Twins manager Paul Molitor when he left starter Ervin Santana on the hill for two innings, instead of yanking him when he showed signs of weakness. Santana struggled in his final stint of 2017, allowing four earned runs on three hits, including Gregorius’ homer and a solo shot to Brett Gardner in the second. “All of a sudden, everything you worked for in the top of the first is vanished,” said Molitor, via YES Network. Soon enough, Chapman took the 9th, and the Twins didn’t stand a chance against his infamous 103-mph heaters. The Yankees celebrated their way off the field and destroyed their clubhouse with gallons of champagne before packing their bags for Cleveland. In what should have been a rebuilding year for the franchise with the most championships of any in sports, the kids have graduated. They’re moving on to the ALDS on a hot streak and with momentum, two dangerous postseason facets. The Yankees now face the Cleveland Indians, and as long as their hangover is gone by Thursday’s Game 1, they’ll be a tough team to beat. Deesha writes about baseball for thecomeback.com and works as an associate site manager and production assistant for MLB.com. Follow her on twitter at @DeeshaThosar.